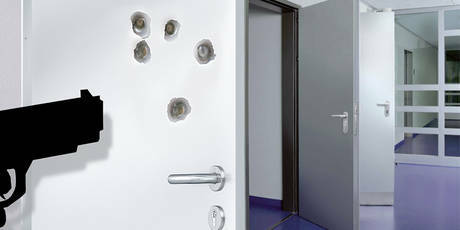 The bullet-proof Teckentrup steel door prevents bullets from travelling through it. Its application areas include, e.g., safe rooms in airports and train stations, police stations, banks, court buildings, police cells in large arenas, but also private buildings which demand a high-level of security. The doors is tested in accordance with DIN EN 1522, Class FB 4.